A TV newsreader has made headlines herself after being shown joking with colleagues and checking her appearance, not realising she was live on air. ITV Anglia's Emma Baker was unknowingly shown for about four minutes across east England during Monday's GMTV show. She reportedly asked an off-screen colleague: "Have you phoned your wife yet or have you phoned Jan?" An ITV Anglia spokesman said it was "banter between colleagues". The company and GMTV are investigating. Baker told the Eastern Daily Press that the blunder had been a "bit of a shock". "Everyone's had plenty of jokes at my expense and are really amused by it," she said. Jim Woodrow, ITV Anglia's head of regional affairs, said: "She [Baker] was talking to the production gallery, then sitting there listening to the gallery, listening to instructions. "She was making sure her microphone was sorted, brushing hair - typical things before a broadcast. "Then there was a realisation that this was going to air, so she started to read the broadcast." He added: "We are not going to comment on speculation about what was said. It was just, as far as we are concerned, banter between colleagues. "There was nothing said which we feel might have upset the viewers, but we are sorry our normal professional service was compromised." 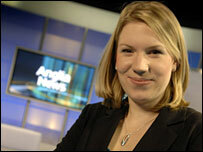 The newsreader was put live on air earlier than scheduled, as she prepared for the 0800 GMT bulletin on Monday. ITV Anglia and GMTV are conducting an investigation into the blunder, Mr Woodrow said.